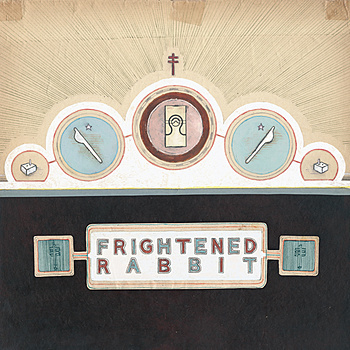 Frightened Rabbit‘s 2008 album Midnight Organ Fight remains one of the most beautifully gut-wrenching albums I know of, and I fell for it hard that year. In his thick Scottish brogue, Scott Hutchison unflinchingly details the brutal end of a relationship with a scalpel and some lemon juice to pour in the wounds. It’s intelligent therapy, and it’s gorgeous catharsis. But one thing we learn as the months go on is that nothing stays that dark forever, and eventually we begin to heal from the rawness. This first single from their forthcoming Winter of Mixed Drinks (due in March from Fat Cat) shows me the next chapter in this story. I know that love and loss are not unique to any of us, but this song feels presciently for me — the fierce uncertainty to this song, the defiant healing, the slight bleeding around the edges that I can still see between all the lyrics. Yeah! these guys are hot! too bad you couldn’t give us the mp3? A buddy from Scotland just turned me on to this band! Danged if I can think of who this song reminds me of…there is also some good stuff from their sets at Daytrotter. Excellent band and real nice guys. If you want to check out another good band from Scotland, take a listen to “We Were Promised Jetpacks”….great album. Another good band from Scotland (and I believe friends with Frightened Rabbit) The Twilight Sad. Great find. The urgency of the music counterbalances with the tentative hopefulness for a new relationship. I’ve been following you for about 6 months and love your taste in music. Thanks.